I think this was supposed to be the second London show on this tour,. They were supposed to start and end it and I had tickets to both. The first was at ULU SOAS Hall but it got shut down on the day by the University because they found out they had been selling to non-students is what I heard (Anyone confirm/deny) so I was really hyped by the Boston Arms gig. An amazing night seeing who were my favorite band of the time. This recording relates to the third out of ten times total Fugazi played the city of London over the years, and is set at the Boston Arms. It features the second and last time the band would hit this particular venue (the other performance played out on December 5, 1988). The time is November 29, 1989 and the occasion is Fugazi’s concluding gig in England, at the tail end of a 1 month + European tour in 1989. As to the performance, I can be brief by simply pointing out that it is truly outstanding from beginning to end, undoubtedly honed by months and months of relentless touring. As such, picking highlights pretty much boils down to personal tastes in song selection, so I am not going to bother here. With regard to the in-between song chatter, nothing much is going on though. Ian does attempt to strike up a conversation with the audience a number of times, but without much success. Other than that, it appears the band repeatedly has to put up with some raucous individuals engaging in a number of tedious activities (e.g. name calling, spitting, stage-diving, Minor Threat requests), but fortunately none of it spins out of control or is overly disruptive. The audio quality of the recording is essentially very good, the instruments and vocals clearly discernible and proportionately balanced. It could be argued that Guy’s guitar sounds a tad low in the mix or Brendan’s tom-tom slightly muffled occasionally, but considering the overall highly enjoyable end result, that would be nitpicking. Interestingly, this particular live performance has been recorded by the late John Loder, a close friend of the band, sound engineer, record producer, founder of Southern Studios in London and longtime collaborator of Dischord Records, overseeing the manufacturing and distribution of many Discord releases. 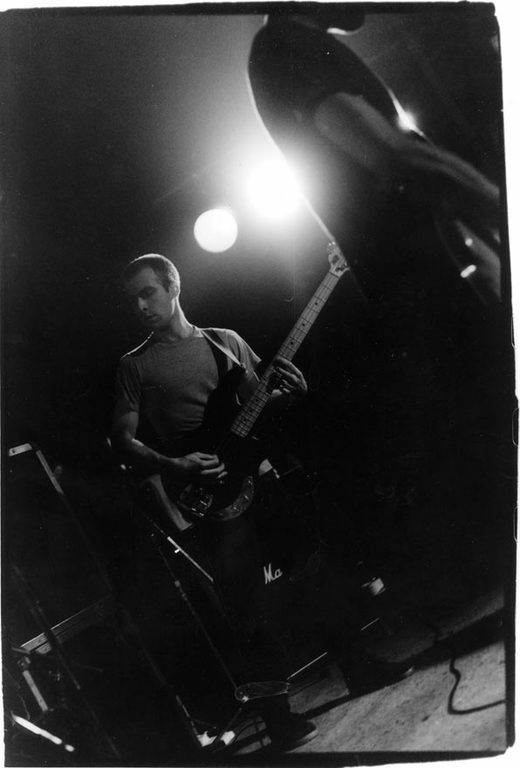 Note that Fugazi’s follow-up Margin Walker EP (released in 1989) was recorded in December 1988, in the wake of their first taxing European tour, at Southern Studios in London with John Loder handling production as well. To conclude, it can be mentioned that the recording showcases 17 live cuts. Out of these, 7 songs are drawn from the Repeater album which would see an official release in April of the following year (while I personally prefer the revved up version of Blueprint which would surface in later years, the version of the powerhouse song presented here is notably slower and true to the official studio release), with 4 songs off of the Margin Walker EP and 6 off of the debut 7 Songs or self-titled EP (unfortunately, Burning is missing here). Memories... I am sure attendance was higher! At 8 p.m. the show was sold out already, but some security guys sold us tickets anyway. I did not regret. Please ad the recording of this soon!! 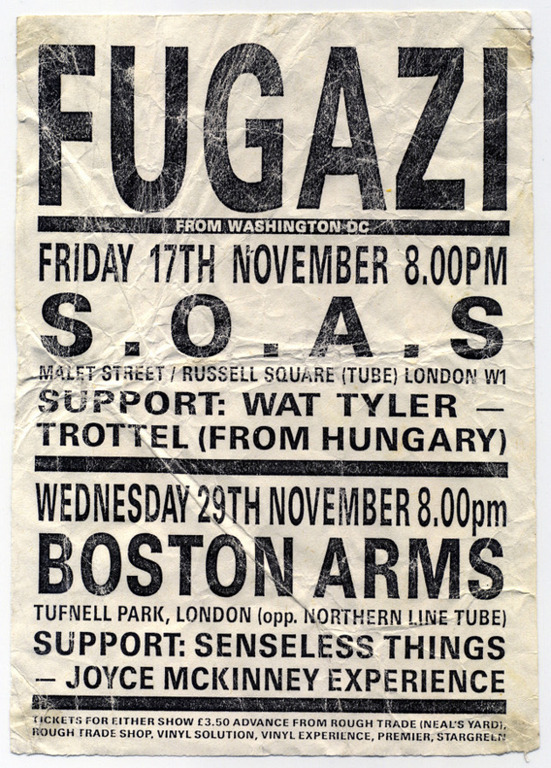 My first Fugazi show... and looks like it might a pretty great recording too. Senseless Things, Joyce McKinney Exp.